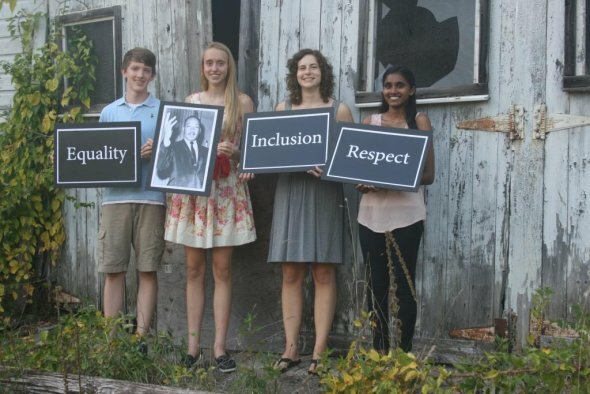 From left, students Zach Walsh, Shannon Cirilli, Jaylyn Perry and Kavya Bana. "An individual has not started living until he can rise above the narrow confines of his individualistic concerns to the broader concerns of all humanity...."
That’s the defining quote pegged as a footnote in emails from Joan Rogers, a student adviser writing on behalf of the MLK in CT Memorial Committee. So many years have passed since King summed up one of the world’s core challenges in just 25 words; so much work has been accomplished, and so much more remains to be done. Almost three years ago, Rogers writes, two dozen Simsbury High School students researched, scripted, and produced a video documentary about King in Simsbury. The students are now working to raise $100,000 to create the memorial, a project that has already received a $20,000 donation from Cigna and $10,000 from Chubb Specialty Insurance, Rogers says, along with many other donations from residents, local and state businesses, and nonprofit organizations since. Valassis Direct Mail, Inc. recently made a $1,500 donation to the project. See MLKinCT.com for more information, to make a donation, or to purchase a personalized tax deductible, engraved brick.